My phone is a go-to portal for news, music, and communication with my friends and family. My phone is a go-to portal for news, music, and communication with my friends and family. So when I'm in the car, I'd like it to be easy to integrate all of these functions smoothly with my car stereo. Pioneer's MVH-2300NEX digital media receiver gives me quick and easy access to my podcasts, streaming music, phone calls, and more, all with easy-to-use interfaces that I can customize to match my taste and preferences. Apple CarPlay offers an easy-to-use interface. iPhone® or Android™ — it doesn't matter. You can plug into this receiver and take charge of a variety of apps for navigation, music, and more from three very cool interfaces. Best of all, you don't have to pick one — Pioneer's made it easy to switch quickly between them, depending on the task at hand. Apple CarPlay™ — Plug in your iPhone and you'll access a super user-friendly iOS styled interface that lets you quickly jump into your music, podcasts, messages, streaming music and more. CarPlay's a no-brainer for me — it's the safest and easiest way to use your iPhone in the car, hands down. Android Auto™ — Your media, nav, phone, apps, and more are organized in a simple, clean interface that gives Android users an easy way to hit the road. AppRadio Mode+ — Pioneer's AppRadio Mode+ provides additional flexibility when your iPhone is attached, letting you tap into apps like Waze for navigation, and providing easy access to some video content through AppRadioLIVE. I depend on streaming services to listen to my favorite tunes and discover new music, so I really appreciate how you can control your Pandora® and Spotify accounts from this receiver. No fumbling with a phone, just swipe and press on the big touchscreen. It's easy to get started — just connect your iPhone via USB or Bluetooth, or pair up your Android™ with Bluetooth® and you're all set. You can even create new Pandora stations on the fly just by pressing a button. The MVH-2300NEX's crystal-clear display offers plenty of customization options, with different backgrounds and key colors. You can set your home screen to display your favorite sources, and then switch between them with just a single touch, letting you pay more attention to the road, and less to operating your stereo. This Pioneer features hands-free calling with your compatible phone, plus the ability to wirelessly stream and control music from all the phones in your family. Plus, with your compatible iPhone, you can take advantage of Siri Eyes Free functionality, using your voice to place calls, select music, hear notifications, add reminders — even compose and listen to text messages. The receiver's LCD screen plays video content in bright, clear detail when you're parked. You can keep your passengers entertained by sending video from the receiver to a rear-seat screen to minimize back seat strife. You'll be able to view video content from your iPod® or IPhone with the addition of optional cables. And you can play it safe when you throw it into reverse by plugging in a rear-view camera. This Pioneer offers compatibility you won't find in many other aftermarket radios, thanks to the iDatalink Maestro module (not included). In a wide selection of vehicles, this module lets you keep factory features that you'd otherwise lose when you install a new radio. You'll also be able to check out expanded functionality on the Pioneer's screen, including gauges, climate controls, a distance sensor, and tire pressure and temperature monitors. Once you've identified your vehicle, you'll see the iDatalink module offered on the way to your Shopping Cart if it's compatible. How long does this unit take to switch into Android Auto once your phone is plugged in? I have a new Pixel 2 and sometimes it can take over a minute for the H/U to switch into Android Auto. Clear Resistive LCD Touchscreen: The Pioneer MVH-2300NEX features a 6.94" clear resistive LCD touchscreen display with a resolution of 800 (RGB) x 480, for a total of 1,152,000 pixels. The clear resistive panel is designed to enhance the visibility of on-screen graphics and images, making them appear clear and crisp. The touchscreen display allows you to control this unit and a connected component such as an iPod/iPhone, Android smartphone, Bluetooth phone, or USB mass storage class device. Menus appear on screen for making function choices, audio adjustments, and setting up the system. Favorites: You can register the desired menu items on the MVH-2300NEX's "Favorites" menu screen. Registering your favorite menu items allows you to quickly jump to the registered menu item by a simple touch on the favorites menu. Up to 12 menu items can be registered as a "Favorite". OSD + Backgrounds: The color of the on-screen display can be set to red, amber, green, blue or white. The background display can be selected from 5 different preset displays for the AV Operation screen and 8 different preset displays for the Home Menu screen. In addition, you can change the background display to other images imported from an external USB device. Variable Illumination: The MVH-2300NEX offers custom illumination for the front-panel controls so you can match your vehicle's interior, plus MIXTRAX Illumination for DJ-style illumination in your vehicle. Front-Panel Control w/ Custom Illumination: In addition to the touchscreen controls, the unit includes frequently used buttons along the bottom edge of the screen. The color of the button illumination can be set to red, amber, green, blue, white, or scan (constantly cycling through the color spectrum). You can also create a custom color to match your vehicle's interior lighting (112 colors to choose from). MIXTRAX Illumination: MIXTRAX features a club-style illumination that enhances the mood with a dynamic dance club-like lighting effect. As MIXTRAX begins, lights start pulsing to the beat of the music, adding an extra level of entertainment. You can choose among twelve patterns of lighting variations from sound pressure level or low-pass synchronization modes. The lighting effects work like a spectrum analyzer, reaching peak colors based on the intensity of the music. Dimmer: The receiver's touchscreen display & button illumination can be dimmed manually, automatically or via a timer. You can set the unit's LCD touchscreen & button illumination to automatically dim when your vehicle's headlights are turned on (this function requires that the orange/white illumination wire in the wiring harness is hardwired to the vehicle's headlight circuit). You can also set a specific time and duration for unit's LCD & button illumination to dim. Remote Functions: The Pioneer MVH-2300NEX digital media receiver includes a wireless remote control and offers steering wheel control capability (adapter required). 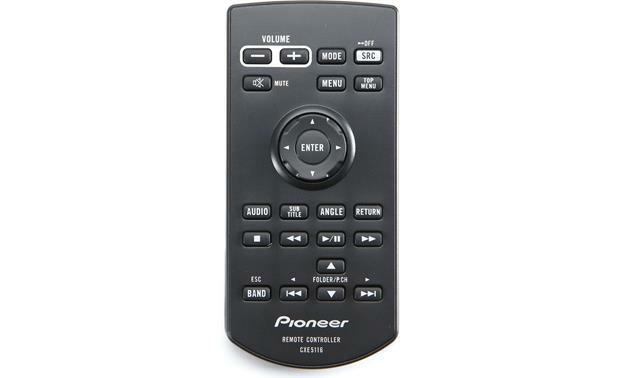 Wireless Remote Control: The Pioneer MVH-2300NEX includes an IR remote control (CXE5116) for wireless operation of the digital media receiver and your connected devices. The included remote does offer Bluetooth phone functions. Google Assistant: The Pioneer receiver enhances your Android Auto experience even more by incorporating Google Assistant using the head unit's external microphone and your car speakers for voice command and text-to-speech, which makes using Android Auto and all of its integrated applications fast, easy, and safe. You will need to press the "mic" button or say "OK Google" to activate the Google Assistant. Use the Google Assistant to make call, send a message, reply to a message, get driving directions, or listen to music. 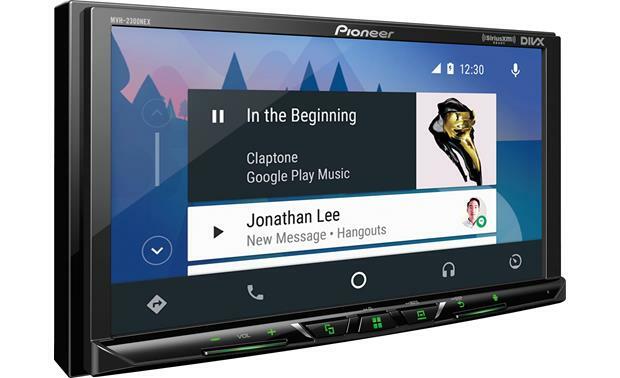 Phone & SMS: With Android Auto you get access to your contacts and messages through the Pioneer NEX receiver while keeping your eyes on the road. Use the unit's external mic and Google Speech Technology to make a phone call, or have your text-messages read aloud to you while you concentrate on the road ahead; you can even reply to texts via voice command. Music: Access your Android smartphone's music library through the Pioneer receiver via Google Play Music. You'll be able to browse music like you do on your smartphone with song/artist information display and album art. Use the receiver's touchscreen to select songs or just say what song you want to listen to through the head unit's external mic and Google Speech Technology. You also get access to online music and radio stations from Amazon Music, Pandora, Spotify, iHeart Radio, Slacker Radio, & Tune-In. Music apps include song and station browsing, plus song/artist information and album art or station logo. Apple CarPlay: The Pioneer MVH-2300NEX features Apple CarPlay, the smarter and safer way to use your iPhone in the car. 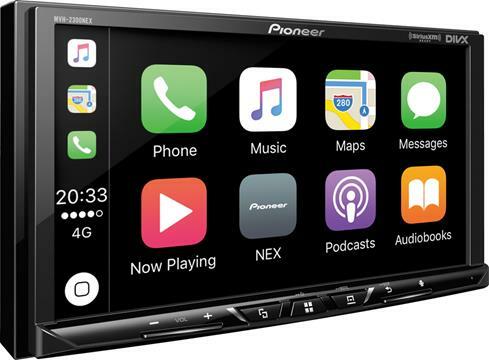 The Pioneer MVH-2300NEX supports Apple CarPlay through your USB-connected iPhone (iOS 7.1+) with Lightning connector. Your iPhone can be connected to the NEX-series head unit's rear-panel USB port via the included USB extension cable and a Lightning-to-USB cable. Apple CarPlay gives iPhone users an incredibly intuitive way to make calls, use Maps, listen to music, and access messages through Siri voice control and the Pioneer receiver's touchscreen controls. Maps: Apple CarPlay brings the power and simplicity of Apple Maps to your dashboard; complete with turn-by-turn direction, traffic conditions, and estimated travel time. You can enter a new destination or choose a favorite or recent destination using the head unit's touchscreen or by simply asking Siri. CarPlay can also predict where you most likely want to go using addresses from your email, text messages, contacts, and calendars. You can even listen to music from your Apple CarPlay device or other connected source device while using Apple Maps. Phone & Messages: Via Apple CarPlay, you'll be able to make calls, return missed calls, and listen to voicemails through the Pioneer head receiver. Siri can also help you do all these things. In addition, Siri can send, read, and reply to your text messages for you; so you never have to look at your iPhone while driving. 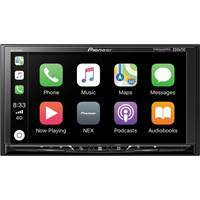 Music Library: Through Apple CarPlay, you can access your artists, song, playlists, and iTunes Radio on your iPhone using the Pioneer head unit's touchscreen. Or, just tell Siri what you'd like to listen to. The head unit's touchscreen will display song/artist information, as well as album art in the background. AppRadio Mode+: The Pioneer digital media receiver features AppRadio Mode+ for Apple iPhones (iOS 9.0+) with Lightning connector and select Android (OS 4.4+) smartphones. AppRadio Mode+ gives you the ability to view and control compatible iPhone and Android smartphone apps from the receiver's touchscreen using a one-cable USB connection. You'll need to download Pioneer's AppRadio app (for Apple iOS 7.0-up / Android OS 4.4+) and the AppRadioLive app (Apple iOS 9.0-up / Android OS 4.4+) onto your compatible iPhone or Android smartphone. Once you have downloaded the apps, your compatible iPhone or Android smartphone simply connects to the Pioneer receiver's USB input using the cable that came with your mobile device. Now that the AppRadio and AppRadioLive apps are downloaded, and your compatible Apple iPhone or Android smartphone is connected the receiver, you have access to maps, media, news information, and your events calendar through the receiver's intuitive touchscreen interface. Maps: AppRadio Mode+, along with AppRadioLive use the native maps from your smartphone overlaid with INRIX live traffic data to provide live traffic and incident information to give you an estimated time of arrival at your chosen destination. Once you select your destination, you'll be guided along your route via an on-screen map and audible voice prompts. Selected destinations can also be sent to popular compatible apps like Waze, Navmii, or Genius Maps. You can even use Yelp to find points of interest along the way, including restaurant ratings and reviews. Media: AppRadio Mode+ and AppRadioLive let you play your stored music library directly from your smartphone through the Pioneer receiver. And, you can access over 60,00 internet radio stations from Radionomy. Or, you can access over 25,000+ radio shows and podcasts from your Stitcher account. Events: In addition, AppRadio One and AppRadioLive keep you up-to-date on the latest news stories, RSS feeds and weather information with Feedly and Open Weather Map. With text-to-speech technology, the Pioneer receiver will even read you the latest news stories from the internet. Calendar: The AppRadio One and AppRadio Live applications also keep your life organized and makes it easier to stay in touch and have fun. With multiple viewing options within its sleek, simple user interface, you can access your smartphone and Facebook calendars in one place, RSVP to Facebook events and use EventSeeker to find nearby concerts and events based on your personal interests and location. Android MTP Playback: The receiver supports MTP for playback & control of stored music files on your Android (OS 4.0+) device through the Pioneer receiver's rear-panel USB port. In this mode, you get basic playback control (like Play/Pause & Previous/Next Track), plus song/artist information on the receiver's LCD screen. During MTP connection, you cannot use your Android smartphone's touchscreen to control music playback and you cannot select music apps from your smartphone for playback. However, you can continue to listen to stored music on your Android smartphone through the head unit while you check your Calendar, Facebook, Texts, etc on your phone. You smartphone's battery will also be charged while connected via USB (5V/1.5A). iPod/iPhone Music Playback via USB: The Pioneer MVH-2300NEX supports direct connection of select Lightning & 30-pin iPod/iPhone models through its rear-panel USB port. The MVH-2300NEX offers audio playback, music navigation, information display, and charging of select Apple iPod/iPhone models. You will need a Lightning-to-USB or dock-to-USB cable to connect your Apple iPod/iPhone device. Control: From the head unit's touchscreen, you can search your iPod/iPhone's audio content (up to 16,000 songs) by Playlist, Artist, Album, Song, Podcast, Genre, Composer, Audiobook, or Radio. Once you have selected a category, you can search each category alphabetically (A-Z). In addition, the head unit offers Link Search, which allows you to play songs related to the currently playing song. Link Search lets the head unit create an album list of the currently playing artist, a song list of the currently playing album, or an album list of the currently playing genre. You can also select Random & Repeat functions for a certain song or specific folder. You can even access your iPhone's Apple Music Radio through the head unit's touchscreen. Song/Artist Info + Album Art: In addition, the head unit will display your iPod/iPhone's stored music information including Track number, Elapsed playing time, Song/Album title, Artist name, and Album art. Charging: The head unit's USB connection provides 1.5A of current to power and charge your connected iPod/iPhone device when your vehicle's ignition switch is set to the 'ACC' or 'On' position. If your iPod/iPhone has no initial battery charge, then the unit will not recognize it. Note: During connection, older iPod/iPhone device's will be locked, but newer Apple devices w/ iOS 6.0+ will stay unlocked so you can also control the iPod/iPhone from its touchscreen or clickwheel. Data Plan Required: Your iPhone or Android smartphone will need an active Data Plan account with connection to the Internet via 3G, EDGE, LTE (4G), or WiFi for CarPlay, Android Auto, & AppRadio to function. Access to CarPlay, Android Auto, & AppRadio's online app services will depend on the availability of a cellular and/or WiFi network for purposes of allowing your iPhone or Android smartphone to connect to the Internet. App services may not be available in all regions. Audio Streaming: A2DP 1.3 (Advanced Audio Distribution Profile), AVRCP 1.4 (Audio/Video Remote Control Profile). 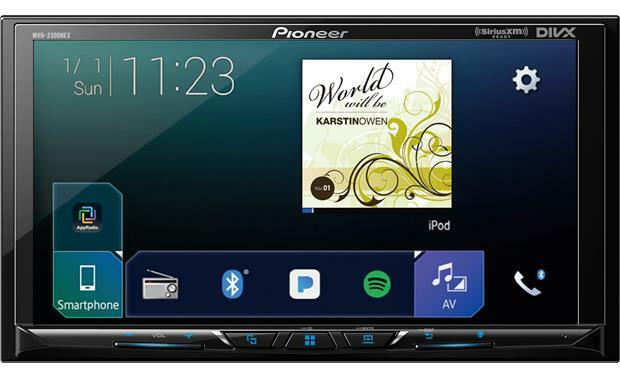 Note: Due to the differences in Bluetooth technology, some Bluetooth enabled devices may be incompatible, function improperly, or may not support all features when used with the Pioneer MVH-2300NEX. SPP (Secure Simple Pairing) w/ Dual Phone Connection: With Secure Simple Pairing (SSP), you can easily pair a Bluetooth enabled phone to the MVH-2300NEX without having to enter pin codes or go through complicated settings. Up to 5 Bluetooth-compatible devices can be paired to this head unit. An already paired Bluetooth device will automatically re-connect with the head unit when it is in close proximity inside the vehicle. You are even able to keep two Bluetooth-enabled smartphones connected at the same time, so you can switch between phones from the head unit's touchscreen, without having to connect or re-connect devices. Hands-Free Communication (w/ External Mic): The PioneerMVH-2300NEX supports wireless hands-free communication for your Bluetooth enabled mobile phone. Thanks to the latest Hands-Free Profile (HFP 1.6) with wideband speech capability, the MVH-2300NEX provides more natural sound quality and details during wireless calls. The MVH-2300NEX allows you to carry on a phone conversation from your Bluetooth enabled mobile phone using the head unit's external microphone and your car audio speakers. During a conversation you can adjust the volume, as well as switch between the Private Mode (talking directly on your cell phone) and the Hands Free Mode. Making A Call: The MVH-2300NEX offers a variety of ways to make calls using the in-dash receiver. Wireless Audio Streaming: The Pioneer MVH-2300NEX also supports wireless audio playback (AD2P) and control (AVRCP) of a Bluetooth enabled audio player or smartphone. The head unit can stream music stored on your Bluetooth enabled device or music apps you have downloaded on your device. When an incoming call or outgoing call is in progress from your Bluetooth enabled mobile phone, audio streaming will be paused so you can take your call. Advanced Music Navigation: In addition to basic playback functions (Play/Pause, FF/RW, Skip, Random/Repeat), the MVH-2300NEX lets you browse your stored music by Playlist, Artist, Album, Song, etc.. (AVRCP 1.4 phones only; which includes Android 4.0+ and iPhone 5.0+). Siri Eyes-Free Functionality: When paired and connected to an iPhone (iOS 6.1+) with Siri via Bluetooth, the Pioneer MVH-2300NEX has the ability to access Siri through its touchscreen and external microphone for Siri Eyes-Free functionality. When activated, Siri voice prompts play through the vehicle's speakers and the user's commands and questions are received and transmitted to the receiver using the external microphone. Siri Eyes-Free provides access to many iPhone Siri functions such as music selection, making phone calls, and audible navigation (map will be displayed on iPhone); as well as listening to text messages, calendar information, and reminders. The head unit's audio is muted while Siri provides audible voice prompts. 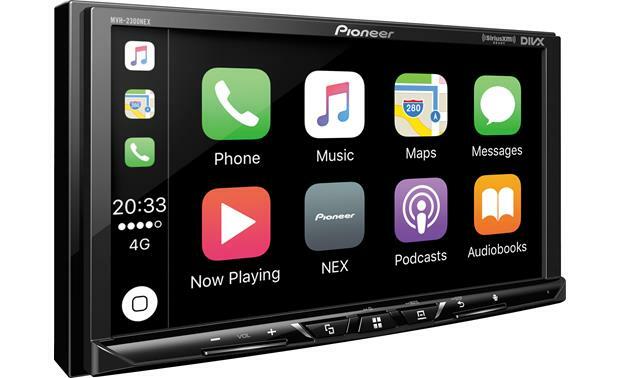 Note: The head unit's touchscreen monitor will only indicate hands-free calling and song/artist information (all other functions of Siri are only audible through the Pioneer MVH-2300NEX; visual data will still need to be viewed from your iPhone device). Spotify Online Music Service: The Pioneer MVH-2300NEX has the ability to playback & control content from the Spotify music app (for Apple iOS 9.0+ or Android OS 4.0+) on your USB or Bluetooth connected iPhone, or Bluetooth connected Android smartphone. Your Apple iPhone must be connected to the MVH-2300NEX via a Lightning-to-USB cable or paired via Bluetooth. Your Android smartphone must support A2DP/AVRCP/SPP Bluetooth profiles and be paired with the Pioneer MVH-2300NEX. Your iPhone or Android smartphone will also need an active Data Plan account with connection to the Internet via 3G, EDGE, LTE (4G), or WiFi. If you are a Spotify Premium user (requires a monthly paid subscription), you can enjoy ad-free, high quality music even when there is no internet connection. Pandora Internet Radio: The Pandora App (for Apple iOS 10.0+ or Android OS 4.0+) lets you play music from the Pandora music service through the Pioneer MVH-2300NEX using your USB or Bluetooth connected Apple iPhone, or Bluetooth connected Android smartphone. Your iPhone or Android smartphone will also need an active Data Plan account with connection to the Internet via 3G, EDGE, LTE (4G), or WiFi. The Pioneer MVH-2300NEX will provide control over the Pandora music service & display Artist, Album, & Song information; as well as Album art. Station List + Presets: You can select Pandora stations from your Station List by date or alphabetically. You can also store six Pandora Radio preset stations for even easier recall. New Stations: New stations can be created based on the current songs or artists playing. Shuffle: You can also listen to songs played randomly from various stations within your Station List. SiriusXM 3.0 Ready: The Pioneer MVH-2300NEX is SiriusXM 3.0 Ready so you can listen to commercial-free music, all your favorite sports, exclusive talk and entertainment, comedy, news, traffic, weather, and more. Simply activate a SiriusXM Radio subscription (fees will apply) and connect the SiriusXM Connect Vehicle Tuner (220SXV300, sold separately) to the dedicated port on the rear of the receiver for playback and control of satellite radio. Check out the most popular SiriusXM subscription packages here. Channel/Category Lists + Song/Artist/Album Info: The Channel List displays a list of all available channels. The Category List displays all available categories and stations within those categories. Information such as Channel Name, Artist Name, & Song Title can be viewed on the head unit's LCD touchscreen. You also get station logo identification and album art on the display. USB MSC Playback: In addition to iPod/iPhone & Android MTP playback, the head unit's rear-panel USB (type-A) port and 58" USB extension cable allows you to connect a USB Mass Storage Class (MSC), such as a USB thumbdrive or portable digital music player. The USB port enables playback & control of music (including high resolution Flac files), video, and photo files stored on your portable USB MSC device through the Pioneer MVH-2300NEX. USB devices that can be charged via USB will be charged when plugged into the digital media receiver's USB port (1.5A) and the vehicle's ignition switch is set to ACC or On. Compatible Media Files: The Pioneer MVH-2300NEX supports the following types of audio, video, and photo files recorded onto an inserted USB device. Advanced Playback & Search Functions: Advance playback functions include; Music Browsing which lets you browse your USB memory device's music library by Artist, Album, Song, or Genre from the head unit in alphabetical order; and Link Play which allows you to play songs related to the currently playing song. Link Play lets the head unit create an album list of the currently playing artist, a song list of the currently playing album, or an album list of the currently playing genre. Dual AV Inputs: The Pioneer MVH-2300NEX has dual AV inputs to connect two external audio/video sources. The head unit has a rear-panel 3.5mm minijack AV input for connecting a portable audio/video device. 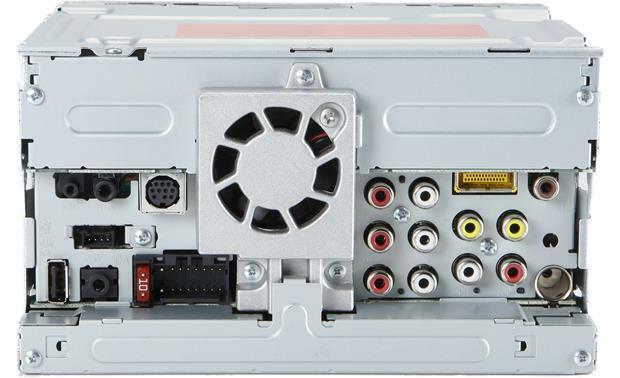 There is also a rear-panel composite video/stereo RCA AV input for connecting a video component such as a mobile TV tuner or game console. Note: CarPlay, Android Auto, & AppRadioLive are not supported by the video output. 24-Bit/192kHz DAC: The Pioneer MVH-2300NEX is equipped with a 24-bit/192Hz digital-to-analog converter for superb quality audio playback from USB, iPod/iPhone, Android, and Bluetooth. MOSFET50 Internal Amplifier: The Pioneer MVH-2300NEX is equipped with a MOSFET amplifier. Compared to conventional power supplies, the MOSFET amplification circuit is smaller and more efficient, and it delivers increased power with less distortion and absolutely zero on/off switching noise. More power means louder and cleaner music at higher volumes because you're not pushing the limits of the amplification circuit. Note: The power specifications for the MVH-2300NEX are compliant with the CTA-2006 Mobile Amplifier Power Testing and Measurement standards from the Consumer Technology Association (CTA). These standards were developed as a way to equitably compare power specs from model to model and between manufacturers. 4V/6CH Preamp Outputs + Sub Control: The Pioneer MVH-2300NEX features three pair of 4.0-volt preamp outputs (Front/Rear/Subwoofer). The unit's front and rear preamp output can be faded (front/rear), while the subwoofer preamp output is non-fading. The Pioneer MVH-2300NEX lets you adjust the subwoofer preamp output's phase (normal/reverse) and volume (+10 to -24). Crossovers: The MVH-2300NEX employs high-pass and low-pass crossovers to tailor the head unit to your connected speaker setup. Auto EQ (Optional): The auto-equalizer automatically measures your car's interior acoustic characteristics, and then creates an auto-equalizer curve base on that information. The Pioneer CD-MC20 Auto-EQ microphone (130CDMC20, sold separately) is required to use this function. The Pioneer CD-MC20 Auto-EQ microphone plugs into your compatible Pioneer A/V receiver's rear-panel AUX 3.5mm input. The Auto-EQ microphone should be placed in the center of your vehicle's driver seat headrest facing forward for EQ measurement. MIXTRAX: Drawing from Pioneer's rich DJ heritage and passion for music, MIXTRAX delivers a unique DJ infused listening experience to listeners in the car. MIXTRAX is an innovative Pioneer technology that creates a non-stop mix of your music library complete with a range of DJ-inspired effects. MIXTRAX takes your typical music listening experience and creates a non-stop mix of your music with 6 random DJ effects and transitions, by removing the breaks and pauses normally introduced between tracks and replacing them with various beats. MIXTRAX is compatible with USB-connected iPhone, iPod, USB MSC device, and select Android devices. There is also a Short Playback option which limits the amount of time each track plays. Note: The MIXTRAX function does not work with CarPlay, Android Auto, AppRadioLive, Pandora, or Spotify. 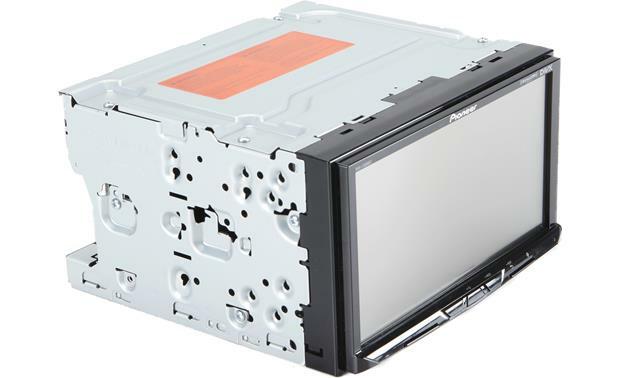 Rear-View Camera Input: The MVH-2300NEX is equipped with a composite video rear-view camera input for the addition of an optional backup camera (130NDBC8, sold separately). When the vehicle's transmission is put in reverse, the screen automatically switches to the rear view camera (violet/white wire of the harness must be connected to the vehicle's reverse lamp circuit for automatic video switching). Automatic video switching takes approximately 0.8 seconds. You can even select for the rear-view camera to stay on at all times, so you can keep an eye on the trailer you are towing. Navigation Ready: The Pioneer MVH-2300NEX allows you to connect the Pioneer AVIC-U280 add-on navigation unit (130AVIC280, sold separately) through its RGB Input. This versatile hideaway unit allows you to switch to navigation mode with the touch of a button. Get to your destination by inputting an address or search through the POI library while enjoying whatever source is currently playing. iDatalink Serial Port: This Pioneer digital media receiver is compatible with the iDatalink Maestro RR (794ADSMRR, sold separately); a web programmable module that will permit the aftermarket Pioneer receiver to work with select Ford/Lincoln/Mercury vehicles that feature the factory SYNC system, select GM vehicles with factory OnStar, select Chrysler/Dodge/Jeep vehicles with U-Connect, select Volkswagens with factory digital amplifier, select Toyota/Scion vehicles, and select Fiat vehicles. Retained Features: The Pioneer digital media receiver lets you retain select factory functions. Retained features will vary by vehicle via the iDatalink Maestro RR. Retained proprietary factory systems can include Ford Sync, GM OnStar, and Chrysler/Dodge/Jeep U-Connect. Other retained factory features may include Steering Wheel Controls, Aux Input, USB Port, Hands-Free Bluetooth, Voice Commands, Satellite Radio, Secondary Display, and more. Extra Features: In some installations, the iDatalink Maestro RR let you configure the Pioneer receiver's touchscreen monitor to operate interior climate controls and provides extra visual data; such as User Selectable Gauges, Vehicle Info (Tire Pressure/Battery Voltage/Check Engine Codes/Door Ajar Warning), and Visual Park Assist. These extra features will vary by vehicle. one of the reviews mentioned an issue with android auto connection with pixel 2 phones. has there been an update to fix this? review was from march 2018. or was this customers issue an isolated incident? Can you adjust rear view camera parking grid lines? Yes you can adjust the "parking assist" feature within the Pioneer MVH-2300NEX menu. For more details or to discuss further please contact an Advisor directly by phone (888.955.6000) or online chat. Thanks! I have a 2017 Honda Accord Sport SE. I lost some original settings on main screen, however I do still have the clock and back up camera. The problem I am now having is when using the hazard lights or using the RIGHT blinker, the original screen (clock) goes blank, it does come back on once the blinker or hazard lights are off, but this is quite annoying. This does not happen if you use the left blinker! Is there a fix for this? sounds like to me that some power or ground wire to tapped into an intermittent 12v source. not sure exactly. would need to see a wiring diagram and some photos. It sounds like it's. Problem with your steering wheel control module. I would use crutchfields support team. They are very knowlegable. Can you connect an ipod and also an android phone for android auto via USB at the same time? No, there is only a single USB. I have a 2010 Chevy Traverse that I am thinking of putting this in. The stock radio has XM radio in it. If I get this stereo and use the idatalink maestro will I still be able to get XM radio or do I have to buy the XM tuner for this unit? Can I use my smartphone through the USB option and allow me to use Spotify etc? My current aftermarket radio doesn't recognize my phone through the USB and can only use Bluetooth. Yes, you can. It is how I connect my I-Phone. Bluetooth connection also works, but USB works better. Yes and also Pandora. IHeartRadio. Yes through Android auto or apple car play. Yes, you can use Android Auto or Apple Carplay through the USB and use Spotify. Looking for a wireless remote for the avh-2300NEX ? Yes it comes with one, no , you can't have mine. Looking to upgrade the h/u on my 2011 GMC Sierra 2500HD with Bose. Will this unit work with the factory backup camera and overhead microphone? will this unit work with the factory usb connections in the center console and the rear console for the back seats in a 2012 suburban. will it work with factory back up camera. the factory camera shows in the left portion of the rear view mirror. factory chimes and alerts come through the speakers, will the adapters carry all these over. I guess what I really want to know is what WILL NOT work when swapping out radios? will this stereo act as a engine monitor? On my F150, I installed this unit with the iDatalink Maestro module, which integrated the Ford Sync system, steering wheel controls and OBDII functions. Based on your vehicle, you can add gauges and other information from the car's computer to the H/U. The OBD cable plugs into your OBD port and runs directly to the Maestro. Yes, it will connect to the OBDII port and let you create custom gauges. I have a diesel and was able to set up boost, EGT and intake temp. On cars with built in Bluetooth, can you use the microphone already in the car to make calls, talk to siri etc. or do you need to install the microphone that comes with the radio? In my F150, I had to add the microphone that comes with the H/U. I was a bit surprised, since I thought the iDatalink Maestro would have integrated that to the system. However, the mic is a direct plugin and you can mount it in a variety of places. Mine is on the forward part of the dash, right behind the steering wheel. My wife tells me she can hear me very clearly on phone calls. My Nexus 6P takes under 30 seconds to get going. I would recommend making sure you have USB debugging enabled on your device. This seems to have helped a lot of folks having Android Auto issues. Also, do a firmware update on the Pioneer device after you get it installed. I have a Pixel 2 XL and this head unit and it can sometimes take a few minutes for Android Auto on the phone and the head unit to switch. I've found that unplugging and replugging a few times as well as manually opening Android Auto on the Pixel 2 while plugged in sometimes helps push it along, but other times the head unit switched within seconds of plugging in the phone, so I haven't found anything 100% reliable. Sometimes I will just start driving and within 2-3 minutes it will switch over by itself. Not the end of the world but a little frustrating sometimes. Everything has so far worked itself out, just with a bit of a delay. I've only used car play and it connects as soon as it's connected for me. I have a Samsung Galaxy S8. Mine takes no more than 10 seconds once plugged in. I like the clean look but I'm not shore about 14 Watts for this 80's rocker. Any input? 80's rocker too! I got the unit mainly for Apple Carplay. I use the unit with my stock speakers (Toyota Tundra) and they sound fine but I haven't really cranked it up yet. You may want to consider an external amp along with this. Check out "Five Star Car Stereo" on YouTube and search their page for NEX. They have a lot of info but may not answer the question you have. This product specifies â?Apple CarPlay Compatible?? . Does this mean Apple CarPlay is included with the unit or is this an add on? It is included with the unit. Your iPhone has to plugged in via usb cable, it is not Bluetooth. I would recommend using a genuine apple cable coming out of the back of the receiver. Apple Car Play is a built in mode of the device. It works exactly as you would expect. Does Bluetooth mode come back on when you turn the vehicle back on? whats cool is it doesn't actually disconnect for some time after you shut off the car. So if you get gas , it stays connected and is instant on . Great feature. Yes it does...just make sure you have the auto connect enabled or turned on. Will the Google Maps on my iPhone display on the screen via Bluetooth? If I plug a flash drive with music on it into the USB port, can i navigate through the songs on the display? Can I search for an artist, album, or song by typing or scrolling? U can make folders and put artists into the specific folders on the USB for easy manipulation of tracks. 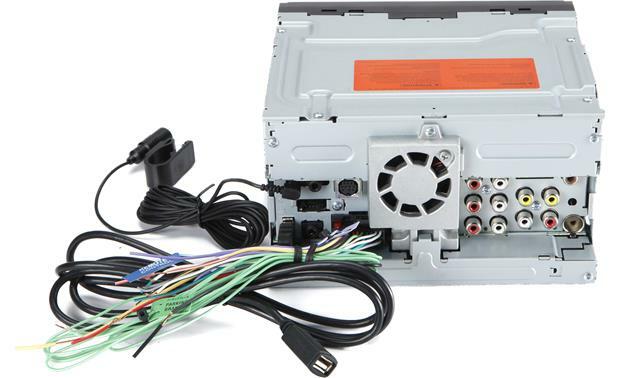 Do you have a plug & play adapter for this NEX-2300 to a 2003 Ford f150? Does Android Auto work wirelessly or does the phone need to be plugged into USB? Interested mostly in whether Google Maps will work wirelessly, but imagine that if so other features should as well. Phone features can be accessed wirelessly by the receiver using bluetooth, however, they are very limited. Apple CarPlay function/software (and Android Auto I believe - I only have an iPhone) only can be utilized via USB connection. Bluetooth calls up a different set of non-Apple software that allows the iPhone to function like an iPod for music play. And really, that's about it. You need to plug in to USB to get Android Auto or Apple CarPlay. This unit comes with a USB port on the back and a USB cable to route the port to where you need it.